Good: Fantastic checklist, Large variety of good to great potential pulls, Few condition related issues, Guaranteed booklet or dual auto in each box and High quality patches for the most part. Bad: Price, Mediocre base card design, Booklets lacking some of the "wow" factor that preceded these highly anticipated hits. The Bottom Line: There are very few NFL rookie classes that could hold their own against the elite group of NFL draft picks that took the gridiron by storm in 2012. The number of superstar rookies, as well as the depth of rookies with star potential, led to very strong 2012 football card product sales. 2012 Topps Five Star Football is a fitting, high end conclusion to this unforgettable season as it features the rarest rookie cards of many of the 2012 classes' top players - all of which feature on-card signatures and player worn patches. In addition to the plethora of high end rookie cards of the best and brightest first year players, 2012 Topps Five Star Football also features a fantastic variety of autographs of Hall of Famers and veteran stars, as well as multi-autograph combinations of the three groups. Gone are the wide scale condition issues that plagued 2012 Topps Five Star Baseball. While the base card design leaves something to be desired, no one is shelling out big bucks for the base cards. The cards look best where they matter most - in the rookie autograph patch cards, the booklet autographs, and the various other autograph and jersey patch hits. 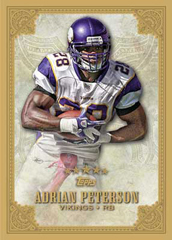 Does 2012 Topps Five Star Football live up to it's name and earn a full 5 star review score? Not quite, but it is certainly comes close. And it's something that any football collector after a true high end, premium experience should seriously consider purchasing. I'm not too crazy about the base set design. And overall, this is the one area where National Treasures has Five Star soundly beaten. Base set aside, Five Star up's their game for virtually all of their autograph and player worn memorabilia cards. And considering you are spending upwards of $400 for a box, chances are your eyes won't be on the base cards (though they are selling surprisingly well on the secondary market), so the set's design as a whole is actually quite nice. I've watched a few 2012 Five Star Football case breaks in addition to the box I broke and the condition of the cards, from the base cards, to the booklets, to the dual autographs and everything in between is consistently excellent - which is quite an accomplishment given the thickness of the cardboard stock used by Topps. The checklist is flat out fantastic. It capitalizes on the strong 2012 NFL Rookie Class by providing some of the lowest quantities of the key rookies seen this season. But because of the premium nature of the set, this isn't a bad thing as chances are very good you'll benefit from the scarcity if not right away, in the not too distant future. And the 35 subjects included in the Base Rookie Autograph Patch checklist are the top 35 offensive rookies of the year. Obviously you'll be shooting for a Luck, RGIII, Wilson or Martin pull here, but even if you don't hit the top tier of rookie talent, the bar is high enough that you won't be cursing the cardboard gods for leaving you hanging with an Offensive Linemen, Cornerback, or unsigned free agent autograph pull. Plus all these rookie cards feature on-card signatures, many on which are complemented by multi-color jersey patches. But Five Star is by no means a one trick pony. Because in addition to it's strong assortment of rookie autograph, multi-autograph, and patch subsets, there are tons of great Veteran Stars and Hall of Famers with multiple autographs and/or game used jersey patches in the set. This list includes the likes of Barry Sanders, Brett Favre, Bart Starr, Jim Brown, Emmitt Smith, John Elway, Kurt Warner, Joe Montana, Jim Kelly, Adriane Peterson, Dan Marino, Jerry Rice, Matt Ryan, Aaron Rodgers and, well, I think you get the point. It goes without saying that $400 is a lot of money to pay for a box of sports cards. However, I think this is going to be one of the products people look back in 5 or 10 years and wish they had scooped up more of. 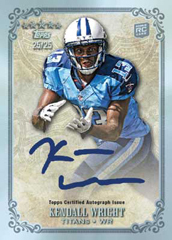 The 2012 NFL rookie class will have its share of Hall of Famers and Superstars, and as the years and decades go on, the Super-Premium autographed rookie cards in Topps Five Star will be among the most coveted and valuable. If you don't have the cash to buy a box, you could do a lot worse then to invest some money in purchasing some key 2012 Five Star rookie auto's on the secondary market as there is tons of upside here. If you compare it with rival premium football product 2012 Panini National Treasures Football, which costs over $550 per box, there is actually a very distinct price advantage in favor of Five Star. You can use the $150 you saved by purchasing Five Star on picking up a hobby box of 2012 Topps Chrome Football Cards or 2012 Panini Prizm Football. Or with Mother's Day coming up, use that extra $150 to buy your wife or mother (or both) some roses and take her out to a nice dinner away from the kids. The further back into collecting I get, the more I enjoy ripping premium high risk, high-reward products. Only a few box breaks I've seen of 2012 Topps Five Star Football would qualify as being horrible breaks. I've seen a substantial amount of great breaks though - one box in particular comes to mind. It was part of a live group break in which participants bought spots based on conference. One lucky collector chimed in at the last minute, purchasing the rights to any NFC North pulls made from the 1 box break. The box featured a Bart Starr autographed patch booklet and a Brett Farve autograph Rainbow Parallel, among other impressive hits. But I digress. Like any other product, the majority of breaks will be somewhere in the middle. But unlike the majority of products, there is something particularly electric about the possibilities that lie before you as you carefully tear your way into the cleverly packaged plastic mini display case that makes up the outer packaging of 2012 Five Star Football boxes. Is it fun? I sure thought it was. If it's too rich for your blood, there is no shortage of great 2012 football card products on the market available at all manner of price point. But for those in search of the top super-premium experience of the football season, look no further then 2012 Topps Five Star Football. 35 cards. Inserted 1 per pack. Click here for a complete visual guide and print runs for individual cards. In just a couple of years time, Topps Five Star has established itself as one of the hobby's go-to brands for ultra high-end cards. 2012 Topps Five Star Football is no different, delivering five major hits in every single-pack box. Four of those hits have autographs. Alongside National Treasures, Topps Five Star autographed patch rookie cards have become the benchmark for football's first-year cards. Every pack delivers one of these cards, which are official rookies. More than 30 players make up the checklist. Parallels come with jumbo patch swatches. These include Gold (#/55), Rainbow (#/25) and Five Star (1/1). Click here for a complete rookie card visual guide. Each pack also comes with a Five Star Futures Autograph as well, which focuses entirely on rookie players. Rainbow and Five Star parallel versions exist for these autographs as well. Collectors can also look for Five Star Futures Quotable Autographs that come with an inscription. Rookies aren't the only hits in 2012 Topps Five Star Football. The third hit is either an Autograph or Autographed Patch card from a veteran player or retired star. Current players include Aaron Rodgers, Adrian Peterson and Tony Romo. Jime Rice, Joe Montana, Steve Young, Emmitt Smith and Brett Favre are among the retired legends. Five Star Signatures are the basic autograph versions. The checklist of more than 20 players comes with Gold (#/25), Rainbow (#/15) and Five Star (1/1) parallels. InscribedFive Star Quotable Autographs come numbered to 10.Five Star Signature Patch cards are all numbered. Gold (#/40), Rainbow (#/25) and Five Star (1/1) parallels are included as well. 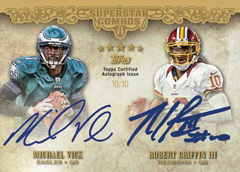 The fourth hit in 2012 Topps Five Star Football is either an Autographed Book Card or a Dual Autograph. Five Star Signatures Book and Five Star Futures Autograph Book Cards come with three relics. Rookies also have four-piece cards. All have three patch parallels numbered to 15 or less. Dual autographs come in many combinations. Rookies are the focus in Five Star Futures Dual Autograph, Five Star Futures Dual Autograph Patch Book, and Five Star Futures Quadra-graph Book Cards. Five Star Superstar Combos add veterans to the mix and are numbered to 10. Book card autographs have as many as eight different autographs. Unique hits include dual autographs with NFL Shield patches and laundry tags. The final hit is a jumbo relic, all of which are numbered. Among the best hits are one-of-one Letters and Dual, Triple, Quad and Octo Patch cards. 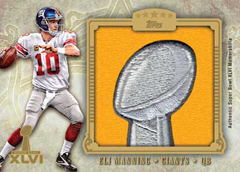 Special patches come in the Pylon NFL Patch, Pylon Super Bowl Patch and Super Bowl MVP Pigskin Relic sets. 2012 Topps FIve Star Football has a limited number of additional hits. These include redemptions for full-sized autographed rookie jerseys. Limited to five, Rookie Yearbook Cards are over-sized book cards that have a Rookie Premiere group shot on one panel and patch swatches from the more than 30 participating players on the other. Luck and Griffin, Five Star Giants measure 8.5" by 11.5". The framed cards have full-bleed action photography. They're autographed and numbered to 5. Not to get lost in the shuffle is the 2012 Topps Five Star base set, which has 150 veterans and retired players. Base cards fall three per pack. do you have any information on the hand stamp redemption cards?TY. Jeff � If I remember correctly, they’ve been in a few sets now. They’re oversized autographed cards that also have a player hand stamp on them. They wear a glove, dip it in ink and make an imprint on the card. Any info on the base cards that don’t have a serial number on them? I assume they’re 1/1? Adam � I’m not sure – haven’t seen any myself. Perhaps they’re misprint errors? Five Star Football hasn’t made me a millionaire, but I’ve had 2 great pulls out of each of the two boxes I have purchased. 1st= Ronnie Hillman auto 1/1 & Richard Wilson Basic auto (exchange); 2nd= Adrian Peterson auto/Patch & RG III/Trent Richardson dual patch/auto RAINBOW (Exchange). I’m fully satisfied…..Just hoping the “exchage” doesn’t take forever. MRTURKEYMAN11 � The base version of the Ballard is numbered to 50. The parallel is numbered to 55 (I know, doesn’t make much sense). 2012 Topps Five Star Factory Sealed FB Hobby Box 4 AUTOS Russell Wilson RC ?